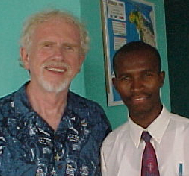 Tom Luce went to Haiti in April 04 as a member of an investigative delegation of EPICA (Ecumenical Program on Central America and the Caribbean, now defunct, but which organized the “Sanctuary Movement” in the 80’s). The purpose was to investigate the ousting of former President Jean-Bertrand Aristide. It became clear that this was an illegal coup d’état. The delegation was there to visit all relevant officials, grassroots groups and the former Haitian Prime Minister Yvon Neptune, imprisoned illegally by the Latortue government. Rev. Angela Boatwright, a member of this EPICA delegation has a report available on the Fellowship of Reconciliation website. HURAH, Inc. grew out of a chance meeting in April 04 at the Haitian National Penitentiary in 2004 between Tom Luce and Evel Fanfan, president of the Haiti-based Association of Groups Committed to a Haiti with Rights (AUMOHD). Luce returned to the United States and began focusing his efforts on Haitian human rights issues through the April6VT Citizens Lobby, a group of more than 800 Americans committed to promoting peace and justice worldwide. A former Catholic priest, Luce first learned of human rights abuses in Haiti under the brutal Duvalier dictatorship from one of his classmates in the seminary, Father Max Dominique. 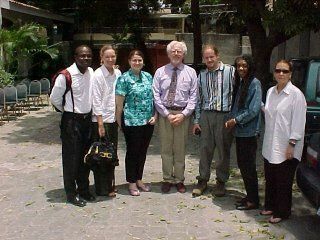 AUMOHD President Evel Fanfan invited Luce to return to Haiti to collaborate with him, and an informal partnership began in June 2004. In July 05 Luce established HURAH and provided accompaniment services (a visible, physical, international presence alongside Haitian human rights workers in visits to courts, prisons, and on the streets) and financial aid in the form of phone cards, transportation and other expenses (court and other legal fees) to Fanfan’s pro-bono organization. AUMOHD provides legal assistance, representation and advice to poor, unlawfully jailed prisoners, particularly to street children, and to a host of other Haitian non-profit organizations, such as worker’s rights groups. Together, AUMOHD and HURAH worked to establish Community Human Rights Councils in 4 impoverished sections of Port-Au-Prince to provide ongoing advocacy for their communities. HURAH’s formal partnership with AUMOHD ended in 2009, but HURAH continues to pursue ways to collaborate with AUMOHD and other Haitian human rights organizations in the aftermath of the January 2010 earthquake. You can read more detailed history of the partnership by going to the panel on the right and clicking on specific topics for instance, government atrocities.